Whereas we like to think of Oudtshoorn as extension of the Garden Route, it is in fact the principal town of the Klein Karoo (Little Karoo). The Klein Karoo is an oasis-like setting in a fertile valley cupped by the Swartberg and Outeniqua mountain ranges. Crops such as Lucerne, tobacco, fruit, grapes and grains grow here in abundance. Situated on the edge of the Garden Route between the Mountain ranges, Oudtshoorn provides an ideal halfway stopover when traveling between Cape Town and Port Elizabeth. 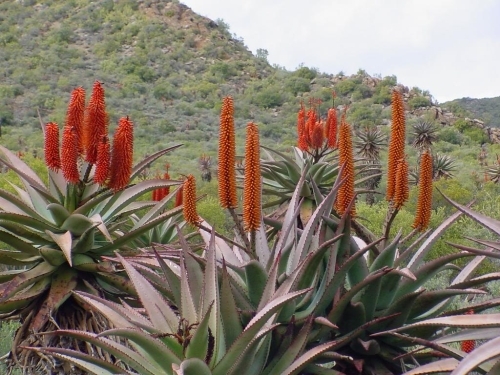 Shielded from the coastal belt by the mountain ranges the Klein Karoo has very little wind, unlike the coastal areas, with Oudtshoorn enjoying sunny days throughout the year. Here you can experience the joy of life in the country and breathe in the healthy, unpolluted air. One of South Africa's eight wine regions, the Klein Karoo is large in area but small in production, yet these wines are classed with the best in the South Africa. The area in which Oudtshoorn is situated was originally inhabited by the Bushman, as evidenced by the many rock paintings that are found in caves throughout the surrounding Swartberg Mountains, is home to the world's largest Ostrich population with a number of specialised ostrich breeding farms such as the Highgate Ostrich Show Farm and the Safari Show Farm. The first large permanent structure of the Klein Karoo, was a Dutch Reformed church erected in 1839 near the banks of the Grobbelaars River. The village (and later town) of Oudtshoorn gradually grew around this church; The town was named after Baron Pieter van Rheede van Oudtshoorn who was appointed Governor of the Cape Colony in 1772 but died on the voyage out. Unfortunately, 1859 also signaled the start of a long and serious drought which severely depressed the national economy - by 1865 there was serious poverty. When the drought was finally broken by floods in 1869 the depression lifted and Oudtshoorn was transformed from a struggling village to a town of great prosperity. The main reason for the large rise in prosperity was the ostrich whose feathers had become extremely popular as fashion accessories in Europe; they were especially popular for use on hats. Between 1875 and 1880 ostrich prices reached up to 1,000 a pair. The farmers of the region, realising that ostriches were far more profitable than any other activity, ripped out their other crops and planted lucerne, which was used as feed for the ostriches. The rising wealth also finally allowed for the completion of the Dutch Reformed Church - it was opened on 7 June 1879. We look forward to showing you this remarkable area. We have our own 4 x 4, and will tailor make trips to suit your requirements. For groups of more than four guests, we will use two vehicles as well as an accompanying 4 x 4 trailer. Our service is personalised. Transfers to and from your B & B, Guesthouse, Lodge, Hotel or Airport can be arranged, should you not be staying with us at "Ebubeleni".